Summer holidays are here (and it feels so good). Time to head off to our favourite beaches to soak up the sun, play in the waves and make the most of these carefree days before the reality of fall and winter set in. Many choose to get off to the Canary Islands for their annual time off work, as these Spanish islands contain some of the best beaches in Europe. Tenerife, despite being one of the most popular choices, is too crowded for you. After checking out the alternatives though, you are in the process of deciding to book flights to Fuerteventura after glancing at the beaches there, and after learning that it is a considerably less busy place than Tenerife, you leapt at the chance. With seemingly endless dunes stretching from the front of the beach well into the interior of Fuerteventura, Corralejo won’t just prove to be a great place to swim, but it will also be a locale where your mind and body will achieve supreme relaxation. The brilliant white of the sand will astound you as you stroll from your rental car to the beach, where you can take up windsurfing if you’re feeling adventurous, or simply rent a sun lounger if you just want to absorb the comforting rays of the Canarian sun. Those looking for a wilder experience would do well to spend their time at El Cotillo beach, where the swells are wild, the surfers are plentiful and the coastline is filled with scenic and rugged rocks. While this location is fairly quiet for now, this place is finding increasing favor with tourism-related businesses, meaning that you can enjoy the rough waves and have easy access to great hotels, restaurants and bars at the same time. Like shallow warm beaches that are blessedly short on masses of people? So do we. 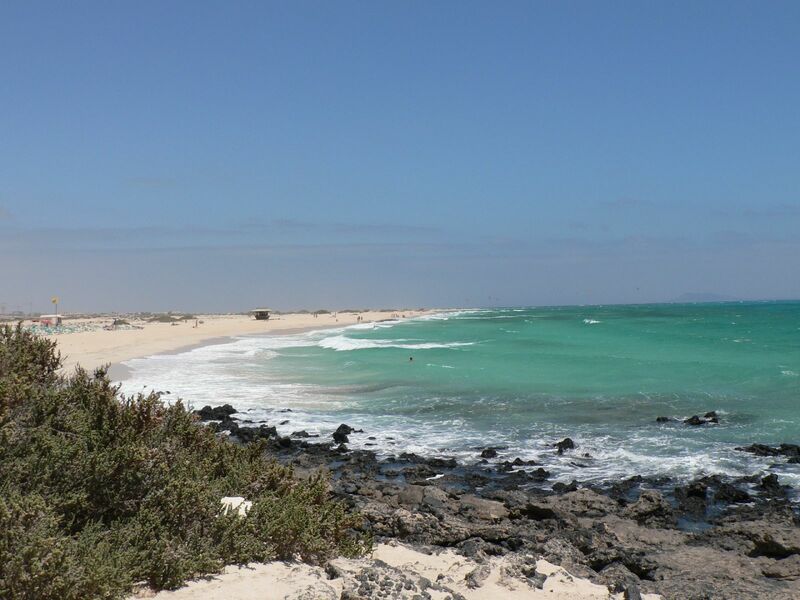 With the mountains of Fuerteventura rising in the background, and the constant stiff breeze of the Trade Winds making the expansive beaches very friendly to kitesurfers, Jandia Beach is a very attractive place to be. With 20 kilometres of space, you can choose to be within reach of restaurants and beach bars, you can move further down and play in the waves with fellow adrenaline sports enthusiasts, or you can keep walking until you are with nothing but your own thoughts, and the power of a landscape that is almost indescribable with respect to anywhere else in the world.